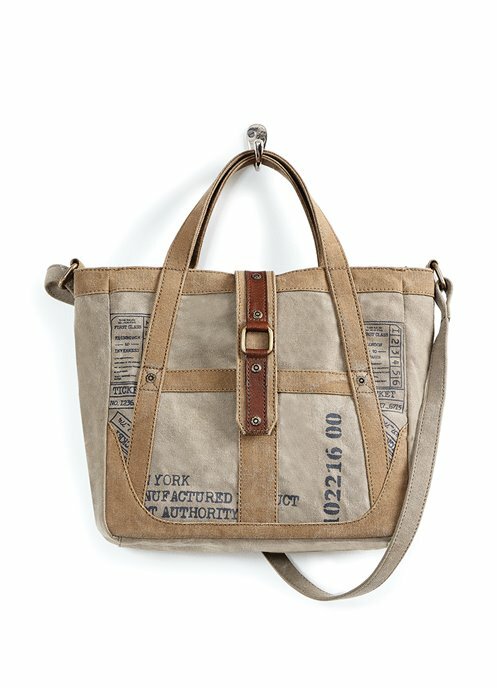 The Portland Canvas Crossbody by Mona B. features vintage-inspired Port Authority passage tickets stamped in gray onto upcycled neutral canvas. Camel-brown canvas accents the front and back. Magnetic flap closure. The leather-accented canvas flap has magnetic closure with decorative metal square ring hardware and rivets. Easy one-handed access to the interior. The interior is lined with signature Mona B. cotton lining and contains one zipped pocket and two slip pockets. One open pocket on the front. Canvas handles with 4" drop, as well as adjustable canvas crossbody straps with drop of 16-26". Dimensions are 10.5"W x 10"H x 3.5"D. Made from up-cycled canvas. The fabric shows the history of its travels which may include stitch marks, minor staining and unique scars and bruises. Color variations and patches add to the uniqueness of each bag. Heavy cotton canvas with genuine leather accents.